A sensational musical meeting of world great jazz soloists with original Polish folk players: a project which proves how attractive, passionate and spontaneous the exchange between different cultures can be! Neither the Kapela Resoviana nor the outstanding soloists Albert Mangelsdorff, Charlie Mariano, John Tchicai, Vitold Rek, Gilbert Matthews featuring on this production had either met or heard one another before making the recordings and precisely this makes for the quality of this venture. This recording was a historical artistic event!!! 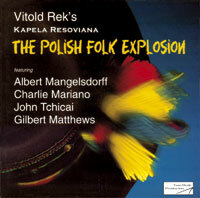 "With The Polish Folk Explosion that features the folk ensemble Kapela Resoviana with Mariano, Tchicai, the late trombonist Albert Mangelsdorff and drummer Gilbert Matthews, Rek effectively melds the musical diversity of Southeastern Poland with world jazz."